There’s no shortage of going-ons on Earth that astronauts can see from space: auroras, towering clouds, volcanic eruptions. Now, there’s a grim addition to the list: a (once) massive iceberg that’s got a date with death. In March 2000, the biggest iceberg ever to peel off the Ross Ice Shelf began its 18-year trek in open waters. Iceberg B-15 started as a Connecticut-sized ice behemoth at around 4,200 square miles—over twice as big as the now-famous iceberg A-68, which broke off the Larsen C ice shelf last July. After a barrage of wind and forceful currents, B-15 gradually broke down into smaller and smaller fragments (as icebergs do). Only four sizable sections remain. 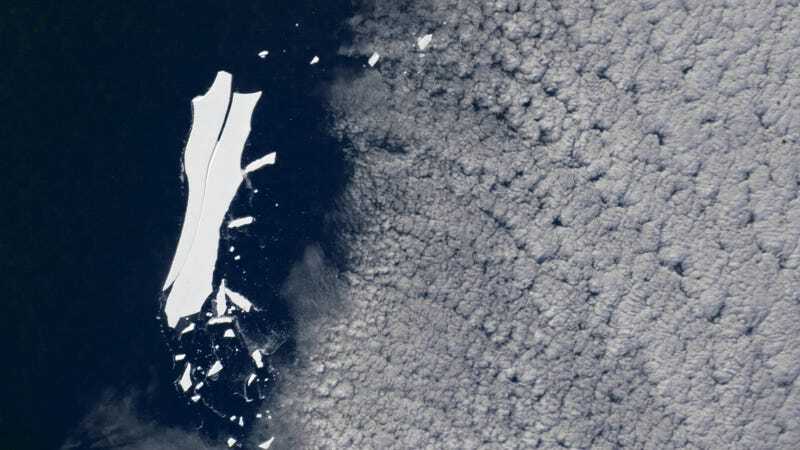 Images taken by astronauts aboard the International Space Station on May 22 and posted this week on NASA’s Earth Observatory have captured one of the few remaining fragments: iceberg B-15Z. When the astronauts captured the picture, B-15Z was about 66 square miles. Though that’s still a trackable size, NASA says it won’t be long until the berg breaks into even smaller pieces, making it hard for researchers to keep tabs on it. According to the National Ice Center, pieces of B15 traveled hundreds of miles westward around Antarctica throughout the eighteen years since it separated from the Ross Ice Shelf, making it as far as the Antarctic Peninsula in the Weddell Sea. B-15z was one of the resultant fragments after B-15's largest chunk, B-15T, broke apart in 2014. According to NASA’s Earth Observatory, “icebergs that make it this far have been known to rapidly melt and end their life cycles.” So it’s only a matter of time. R.I.P. iceberg B-15Z. You had a good run.